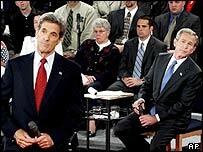 US President George W Bush and his Democratic challenger, John Kerry, have had vigorous exchanges in their second live TV debate on the campaign. The two men sparred over Iraq, with Mr Bush calling Saddam Hussein a "unique threat", and Mr Kerry saying the president had "rushed to war". They also clashed on health care, abortion, taxes, and the economy. Mr Bush appeared more spirited than in the first showdown, which Mr Kerry was widely perceived to have won. The Massachusetts senator saw his standing in opinion polls rise as a result - turning the presidential race into a dead heat. Both sides claimed victory after Friday's confrontation in St Louis, Missouri, and instant polls suggested it was a draw. The format was a town-hall style debate - with the two men taking questions from the audience. At the outset the president went on the offensive, accusing his opponent of inconsistency. "I don't see how you can lead this country in a time of war, in a time of uncertainty, if you change your mind," Mr Bush said. Mr Kerry denied the charge, adding: "The president didn't find weapons of mass destruction in Iraq, so he's really turned his campaign into a weapon of mass deception." On Iraq, Mr Bush said he had not been "happy when we found there weren't weapons" - which were central to the administration's case for war. But he insisted that Saddam Hussein had posed a threat that could not be ignored, and that the world was safer without him. Mr Kerry replied that Mr Bush's handling of the war had left Iraq in chaos, and added that the world was more dangerous "because the president didn't make the right judgments". The Democratic candidate also promised to reach out to allies. "We're not going to go alone like this president did," he said. Mr Bush denied this, and pointed to Britain, Italy and other countries who supported the US over Iraq. The BBC's Rob Watson, covering the debate, says it highlighted the sharply different styles of the candidates. Mr Bush sounded like a passionate preacher, while Mr Kerry made his case like a lawyer. In the latter part of the debate, the two confronted each other on domestic issues. Mr Kerry accused Mr Bush of fiscal irresponsibility, saying he was leaving behind a record budget deficit after being handed a surplus. Mr Kerry also pointed to disappointing employment figures. "This is the first president in 72 years to lose jobs," he said. Mr Bush countered by saying a stock market crash had led to a recession, and that his tax cut had ensured that the slow-down had been short-lived. Mr Kerry accused Mr Bush of cutting taxes for the rich only. Mr Bush said his opponent was planning to tax job-creating businesses. Our correspondent says the two men are hoping to sway undecided voters. A third and final match-up is scheduled for Wednesday in Arizona.